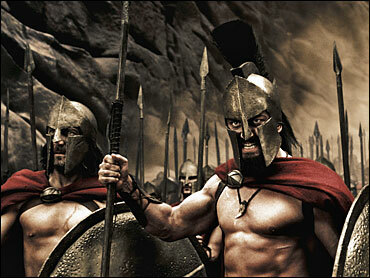 The movie "300" pulled in over $70 million on its opening weekend, a record for a March release. But many are not talking about the movie's infamous gore, but about what it says about Iranians. The Islamic Republic News Agency argues that the film fabricates history, and finds a sympathetic ear in the blogosphere. Some have noted the political overtones of the West-against-Iran story line — and the way Persians are depicted as decadent, sexually flamboyant and evil in contrast to the noble Greeks. According to The Associated Press, Iran's biggest circulation newspaper, Hamshahri, said "300" is "serving the policy of the U.S. leadership" and predicted it will "prompt a wave of protest in the world. ... Iranians living in the U.S. and Europe will not be indifferent about this obvious insult." Some bloggers understand why Iranians are offended. "I left the theater furious. They've got all the blacks and people who look like me behaving like animals when the Persian Empire was one of the greatest forces of civilization in history," Chee blogs at This Ain't So Bad. "The movie does take some liberties on the history as well as making the Persians seem inhuman and mutants in some cases," a blogger at Dave's Life Journal writes. But others say claims of bias are overstated. "This movie makes the Persians the 'bad guys,' but that is to be expected. Most Hollywood movies need bad guys to tell a story. Do most intelligent people fall for the black/white dichotomy? Except for some of my extreme right-wing friends, the answer is no," Steverino blogs. Meggie says the movie is an adaptation, and isn't meant to portray historical fact. "I am well aware of the need to be political correct and culturally sensitive. There is something to love and admire in every person in the world. But please people, let movies be movies," she blogs at Imposter Syndrome. Some are not surprised the movie has inspired outrage. "Even if you lose a battle, you still get to write the history books if you win the war. Movies about the Alamo don't play real big in Mexico. 'Braveheart' and 'The Patriot' were flops in England," Rabbi Tucker blogs. "It stands to reason, therefore, that '300' will not be well-liked in Iran." Sam About Iran simply notes that it's ironic that "300" is popular in Iran, "as what the current regime in Iran fears most is the renaissance of this ancient culture." Saturday marked the end of "The Show With Ze Frank," a popular yearlong online video project produced in Frank's living room. Saturday's episode marked his 250th show. Frank is a 34-year old New Yorker and his quirky shows, as he says on his site, were a "conversation between the host and the viewers of the program," often incorporating viewer comments. He often read comments from viewers of the previous show, and called the segment,"S-s-s-somethin' from the comments." The overall theme of the program was that Ze wanted to join something called "The League of Awesomeness", a society out to make the world a more awesome place. His initiation into the league was to do a video podcast for one year, which became "The Show." Each program ran about three minutes before his usual signoff — "This is Ze Frank — thinking so you don't have to." Bloggers are sad no more Ze Frank Shows are in their future. "One year of episodes was not enough. I'll miss the thought-provoking zaniness that was 'The Show,'" Binary Stream blogs. "After watching The Show with Ze Frank five days a week for the past year, I'm gonna miss it," Hunkagirl adds. "Every show had something in it that would make me laugh outloud, usually to the point of tears. Now I will have to find something to replace it," JustLisa blogs. Wegrit at A Philistine On The Sidwalk says he's "super sad" about it, adding "he's the perfect mixture of intelligence, sarcasm and wit." Many fans recall their favorite episodes. "During the year, we've learnt many things, like how the earth is a sandwich, who loves little duckies, power moves, make a t shirts for someone in Germany, and sports racers will help someone travel across the US & back and what makes an ugly Myspace page," Jazza blogs at Life In The Not So Fast Lane. "Ze has given us all some knowledge, and it's up to us to use." "I am hopeful the gift he gave, that of encouraging people to create and contribute, continues. So long Ze, and welcome to the League of Awesomeness. It couldn't be more deserved," a blogger at Arcane Code reflects. It may be officially over, but if you haven't seen the shows, you can still check out the archive. There's always a chance with Wikipedia that some of the entries are incorrect. "The free encyclopedia that anyone can edit" lets its users catch factual errors. And comedian Sinbad was its latest victim, after rumors began circulating that he had died of a heart attack. "Saturday I rose from the dead and then died again," Sinbad told The Associated Press. Someone had edited his entry to say Sinbad died of a heart attack. By the time the error was caught, e-mail links circulating news of his death had been forwarded to hundreds of people. A note on Sinbad's Wikipedia page says the site has been temporarily protected from editing to deal with vandalism. Many bloggers, while not diehard Sinbad fans, were not happy about a false Wikipedia entry. "I have such a love-hate relationship with Wikipedia," Liberal Debutante writes. "The online encyclopedia is known for many things, but it has never been a part of a killing!," BJCrock adds at Blaw, Blaw, Blawg. "The problem with unrestricted community involvement in online research is the great risk to truth and accuracy in the reporting," David Boles writes. Some mock that the attention might just be what Sinbad's career needed. "I guess Sinbad will have more stuff for his stand up routine," a blogger at Tech.Life.Blog writes. "Wait, is he still a comedian?," a blogger at Kofi's Hat asks. "Sinbad announced that, while his career may be on life support, he's still very much alive," HotStop writes. As for Sinbad, he seems to be taking it in stride. He told the AP, "It's gonna be more commonplace as the Internet opens up more and more. It's not that strange."